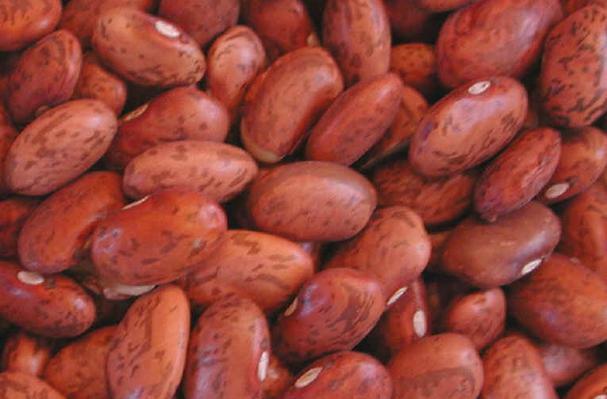 Pinto beans are mid-sized brown to pink beans, usually sold dried or canned. Pintos are a staple of real Tex-Mex cooking. Dried Pinto beans are speckled, but when cooked they are of uniform color. Pintos are served either whole, in a light stock with onions and bits of pork, or mashed and fried (the classic re-fried beans). Black beans have become extremely popular in recent years, but they are never used in authentic Tex-Mex cuisine, where the pinto is king. When dried the pinto beans are a beige/brown speckled with black tiny spots. When cooked or found in a can the beans are completely medium brown with no more spots. Food complements: Mexican food is a great complement with beans either inside the dishes or as a side with mexican rice.pinto beans are also great in bean soups or spicy chili. Choosing: When buying beans dried make sure to sort through the beans in case a few rocks got into the mix. Make sure to wash the beans with water, and soak in water for several hours or overnight to make cooking faster. Buying: Pinto beans can be found at all grocery stores, as well as hispanic speacialty stores. The come dry or in cans, dry are less expensive. Buy shiny beans. Dull or faded beans indicate that they have aged. Aged beans take longer to cook. Dried pinto beans are sold in bags, which usually contain some small rocks and other pieces of dirt. Because of this, you need to sort the beans before using them. Remove any rocks or other debris you find, as well as discolored or oddly shaped beans. The most tender bean comes from allowing the beans to soak in cold water overnight. Discarding the soaking water (you can use it to water plants!) eliminates many of the ogliosaccarides that cause flatulence. Place soaked and rinsed beans in a heavy pot or pressure cooker with twice the amount of liquid:dry beans. If you started with 1 cup dry beans, add 2 cups liquid. Add any spices you intend to use at this point. Cumin or chili powder are nice with pintos. Bring to a boil, reduce to simmer and simmer with the lid on for 45-60 minutes, until bean is easily mashed with a fork. Pressure-cooking beans is faster (30-40 minutes) and will render a creamy texture. Cleaning: Rinse the beans well in cold water, ensuring that all the dirt and other debris are removed. Dried pinto beans should be stored in an airtight container, free from moisture, at room temperature.